Many of us can trace the inspiration for careers or lifelong passions back to a single event or childhood activity. 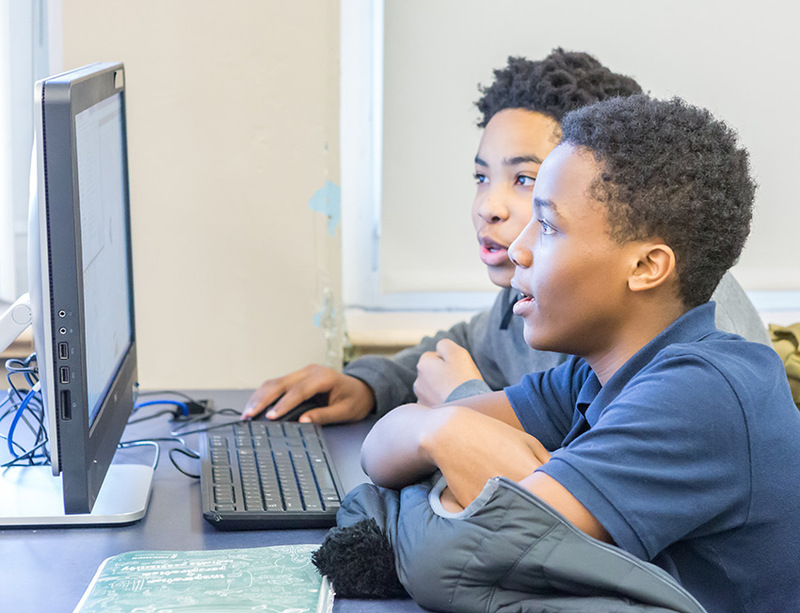 Judging by the eager smiles on students’ faces as they participated in Hour of Code events, that moment may have arrived for some future computer scientists in the Chicago area. 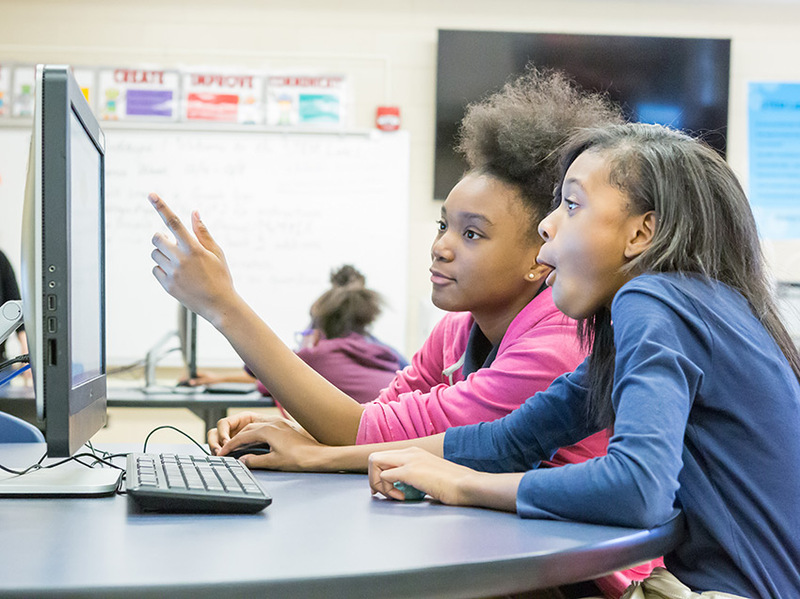 Hour of Code is a global event to spark students’ interest in coding and computer science by spending an hour in December on coding games and activities. To support this goal, the Educational Programs department at the U.S. Department of Energy’s (DOE) Argonne National Laboratory partnered with DOE’s Fermi National Accelerator Laboratory and the University of Chicago. They sent 50 scientists to Chicago area schools from December 4 to 8. Argonne, Fermi and University of Chicago computer scientists visited 57 Chicagoland schools, speaking to students about how they became interested in science as kids, and how coding is involved in their daily jobs. Computer scientists then joined the students in coding activities as part of the worldwide Hour of Code. At a school in the Garfield Park neighborhood, Douglas E. Johnson, manager of national security information systems at Argonne, began the day by discussing the different kinds of computer science used at the laboratory, including different computer programming languages. He described how his team codes in their everyday work, talked about SQL, his favorite coding language, and shared a picture of himself at the same age as the kids in the classroom. As technology progresses, coding is becoming an integral part of today’s industries, and the need for specialists in the field is constantly growing. Many experts say coding is one of the most important skills for future jobs. Argonne’s scientists and engineers know how important it is to encourage an interest in coding so that students can develop these skills. Showing complex-wide support and partnership, five other DOE national laboratories also participated in Hour of Code activities this week, including Lawrence Livermore, Los Alamos, Idaho, and Oak Ridge National Laboratories and the Savanah River Site. Across town, a group of students filed into their school’s Science, Technology, Engineering and Math (STEM) lab and took seats at computers. Greeting the students was Charlotte Haley, assistant scientist in the Mathematics and Computer Science division at Argonne. Because this was Haley’s first time at Hour of Code, and she didn’t know exactly what to expect; she quickly realized that the students “just wanted to have fun” while playing the coding games and she was happy to oblige. “Who turned on their lights this morning?” Haley asked, as most of the students raised their hands. She went on to explain how Argonne tackles energy issues that affect everyone on a daily basis. Haley also told the students how much she loved the feeling of solving a math problem, and that excitement was what convinced her to pursue math and science in college. When asked, the students responded enthusiastically that they shared her excitement about solving problems. Haley then walked around the room as teams of students coded an animated Google logo. One team created a fanciful and colorful logo with unicorns, rainbows and heart shapes. Another team created multiple sharks that swam through water. When one student had trouble getting an animation to work, Haley read through the list of coding commands with him. “What about placing this command at the top?” she asked. The student moved the command, and the logo began to animate. 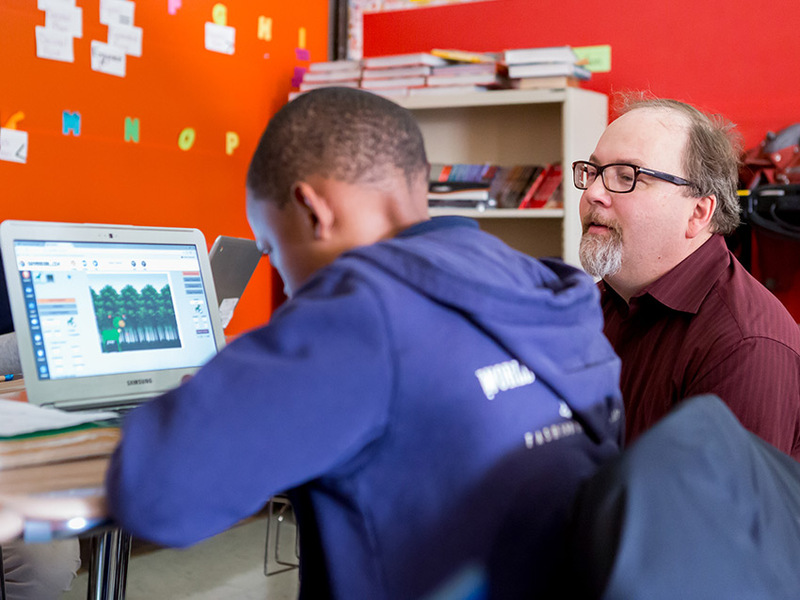 “Students love playing the animation coding games,” said Reese Hobbes, the integration specialist at Wadsworth Elementary who teaches STEM subjects at the school. “We want them to know how important coding is — that they could be the next ones who are coding Angry Birds, and that coding also pays a lot,” he said with a laugh. As Haley talked about her job at Argonne, she mentioned Argonne’s Mira supercomputer at the ALCF, a DOE Office of Science User Facility, and asked students what they would do if they owned the computer. “Solve the world’s problems!” shouted one student, as others in the class giggled. With computer coding providing so many solutions in the modern world, these students just might be on the path to solving more than they can imagine. Argonne's Education department partnered with the U.S. Department of Energy's Fermi National Accelerator Laboratory and the University of Chicago and sent 50 scientists to Chicago area schools in December as part of the global Hour of Code.